Item #CGC-8-450: Colorful Gemstone Collection including Chrome Diopside, Mozambique Garnet, Iolite, Pink Morganite, Peridot, Blue Sapphire, Swiss Blue Topaz and Green Tourmaline. 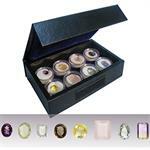 A free 7x9mm oval Gem Amethyst is included with each set. Item #: QTZ-CL-99 Quartz Collection. The set includes Amethyst, Ametrine, Golden Citrine, Dendritic Quartz, Rose Quartz, Rutilated Quartz, Smoky Quartz and Tourmalinated Quartz. Each stone weighs over 2 Cts. Order now and receive a FREE Quartz crystal.